Members of WildFlowerIndia [http://groups.yahoo.com/group/WilfFlowerIndia/] Group have posted the Best Wild Flower Photographs taken by them in 2008. So here the collection of those Best Flower Photographs of India. 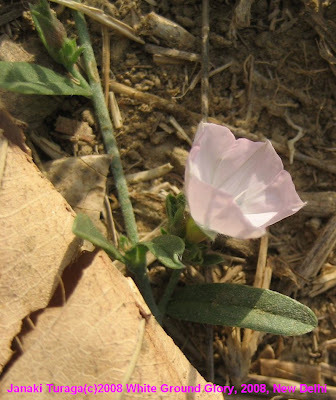 My favourite and best wildflower shot of 2008 is the White Ground Glory Convolvulus microphyllus. This carpeted a stretch of land in Hauz Khas District Park and was trampeled upon by the walkers, oblivious to the delicate and tiny white flowers. But a closer scrutiny of this overlooked and stepped upon plant revealed its hidden glory-the white was actually a continuum of delicate pink and white shades! This picture captures for me that moment of wonder and discovery! And this beauty was set amongst the browns-of earth and decaying leaf and the green of the leaves! Such a delicate flower was literally at the feet of people! I have shared this picture earlier with the wildflower group and here it is again! 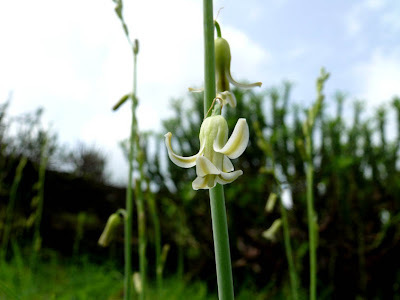 "Dipcadi saxorum, which is a wild flower endemic to Sanjay Gandhi National Park (SGNP) in Mumbai. This was taken during the monsoon season in July. A small rocky hill was practically dotted with these small upright, knee-high stalks bearing these small white flowers. Not having seen them in 2007 I decided to check what these are and was delighted to learn that I was able to see an endemic species." Members of AmphibianIndia [http://groups.yahoo.com/group/AmphibianIndia/] Group have posted the Best Amphibian Photographs taken by them in 2008. So here the collection of those Best Amphibian Photographs of India. Ichthyophis species: The Legless Amphibian- a Caecilian from Vallakadavu range of Periyar Tiger Reserve, Kerala. 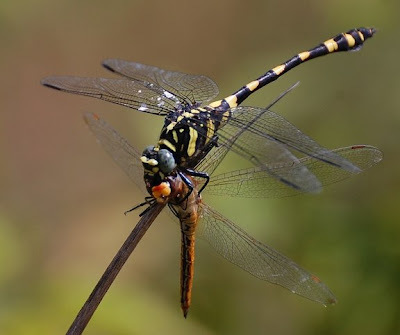 "Striped Ichthyophis" (Per Com. Varad Giri).These amazing legless Amphibians always eluded me for long time and finally i got to see and photograph two species of them. Only 2 shots are taken of one individual with low flash intensity. These are very sensitive animals. We should always keep in mind that we should enjoy nature and wildlife by respecting it and by knowing what is our footprint. 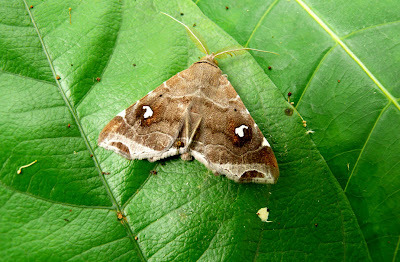 Members of IndianMoths [http://groups.yahoo.com/group/IndianMoths/] Group have posted the Best Moth Photographs taken by them in 2008. 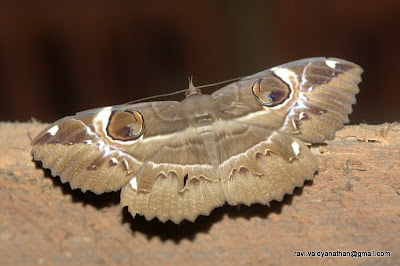 So here the collection of those Best Moth Photographs of India. 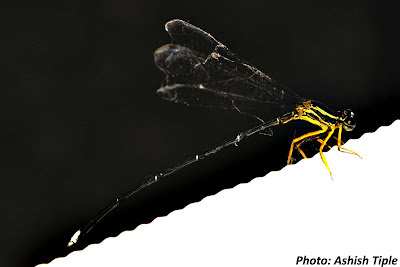 Nyctemera coleta is a rare occurrence in South India, as per Peter Smetacek and Prof K Gunathilraj. Probably the first photographic record is by myself in November 2004 in Bhadra WLS. The next record is by Julie Valsarajan (Coorg, October 2008). Imagine if you see this on a morning walk in Lalbagh Botanical Gardens (Bangalore)! It took me some time to recognize because it wouldn't settle, but I lost it immediately afterwards. I was searching for it, and explained to my 3-years old son Iravan what I am looking for. He is a good spotter at his age, and within 2 minutes he found it out for me again. His excitement "Papa there is the moth! There is moth!" set that guy to flight again, but this time I didn't lose my sight and finally could photograph the rarity! A Catocalinae, Noctuid Moth that I found sitting out in the open during the monsoon season last year. Having recently taken up by the variety in moth species I was literally turning up leaves and poking in the monsoon foliage for moths. I didn't see a single one until our return, quite close to where our vehicle was parked. This is not as colourful as a day-flying moth but attractive enough for me! 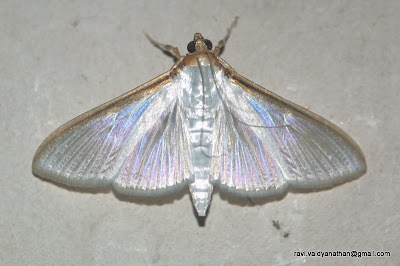 UID moths, Both are from Periyar. After the data collection we use to sit outside in the porch and analyse the data. 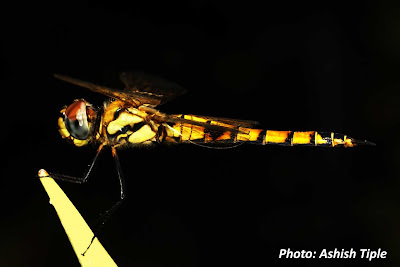 During this time many insects and especially moths use to get attracted towards the head torches. I took this photo at the same time. I like these two because of their colouration and high activity. 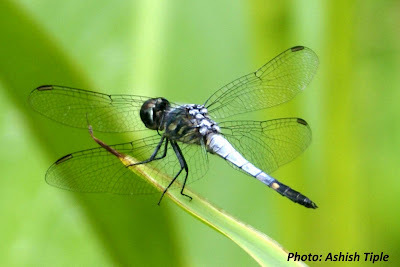 Here is my Photo of Argina argus Kollar,  taken in Bangalore in February 2008. The moth came to my home. It was attracted to the tube light outside house. It looked dull colored, but on being slightly disturbrd it splashed the bight colors of hing wings which were covered otherwise. 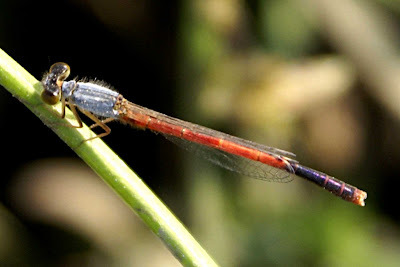 Members of DragonflyIndia [http://groups.yahoo.com/group/DragonflyIndia/] Group have posted the Best Dragonfly and Damselfly Photographs taken by them in 2008. 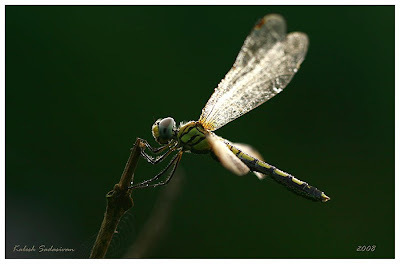 So here the collection of those Best Dragonfly and Damselfly Photographs of India. 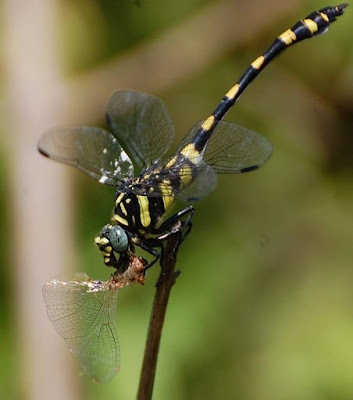 I am attaching a picture taken in Trivandrum,which I hope is my best dragonfly pic of last year, just found him while in was sorting my archives. Patterns in Nature, A microscopic View.... As we all know that most of the things that we see are made up of many small things. So in the same way the structures that we see in nature are also brilliant if we see them in detail. 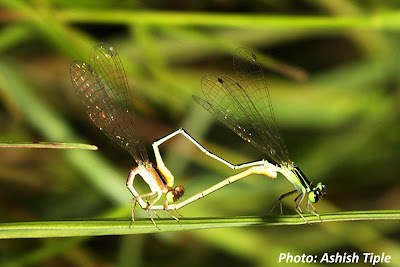 Here you can see a bit of detailed view of Wing structure of Stream Glory Damselfly (Neurobasis chinensis). 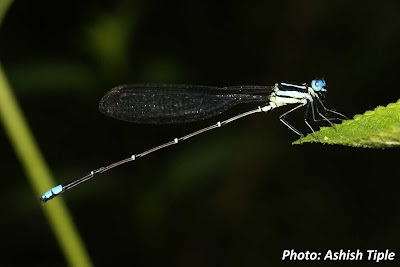 This beautiful damselfly from Periyar, Kerala. This Ruby is so amazing that the pattern on its abdomen looks as if the graphics are designed with a purpose. The flame like pattern with black, yellow and orange colours looks amazing. The wings, in sunlight looks as if they have Neon lights in them. Each part is just so attractive that I enjoyed a lot observing these beauties. 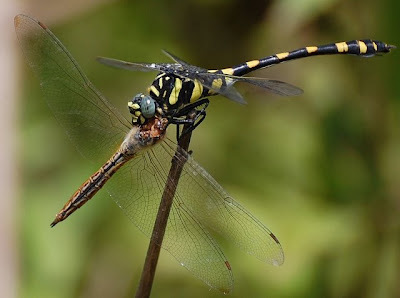 Yellow abdomen with black markings male showing territory behavior. This is looking like golden star shining in black sky. I love to watch this photograph. 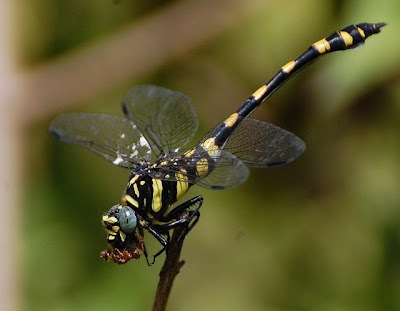 Medium sized bluish black and yellow dragonfly with very fragile wing. Metallic blue body and yellow base observed on thorax. I am feeling like this is like owner of the farm and watching green farm standing at one corner. 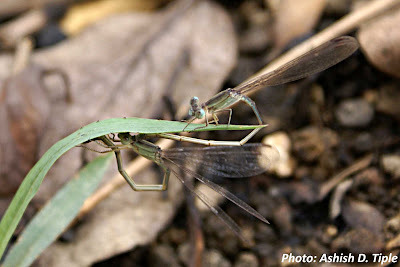 A small apple green and black damselfly and very beautiful you can see mating behavior of both these male and female. 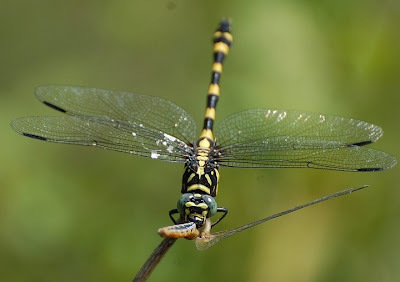 Medium sized black damselfly with yellow markings. This butterfly was trapped inside the spider net and finally this escaped and just sits on my collection box and I took nice snapshot. 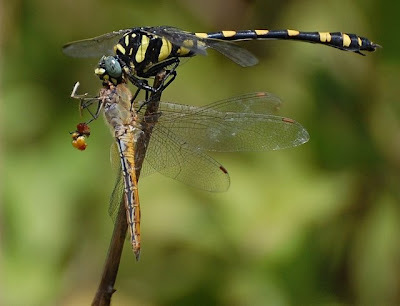 Very beautiful egg laying picture here female is doing contact guarding. It is very nice to watch the male female behavior. This species still not identified properly. 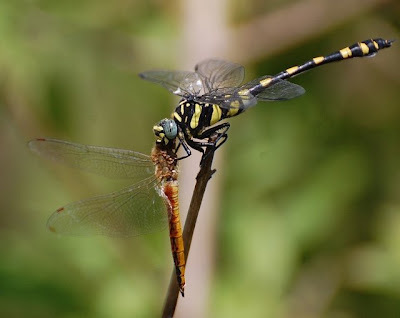 I had always wondered what do these large common club tail feed on. 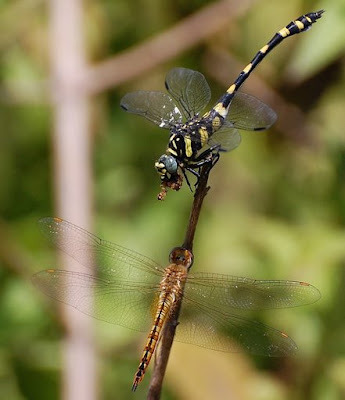 Here is a sequence of photographs depicting the club tail feeding on Wandering Glider (Pantala flavescens) dragonfly. 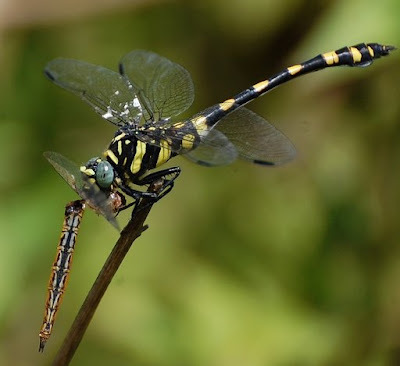 Actually, this particular clubtail dragonfly killed the pantala by biting the pantala's neck after which it began eating its head, removing first its wings and tail before feasting on the thorax completely. 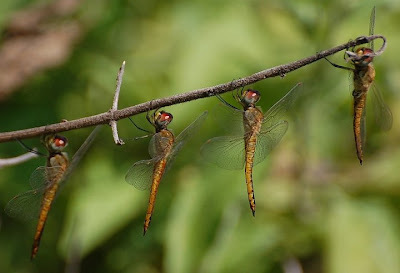 Looks like the other Pantala species perched on the same twig were not aware or perhaps appeared to be least bothered of the feast. 2. 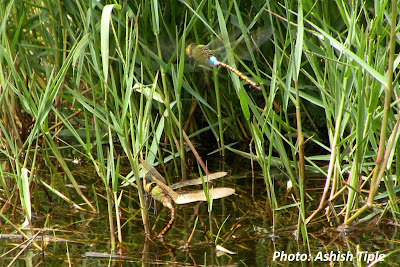 Other dragon flies on the same twig still not aware ? 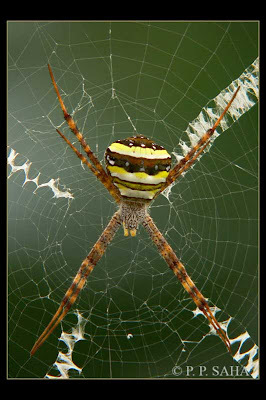 Members of SpiderIndia Group have posted the Best Spider Photographs taken by them in 2008. 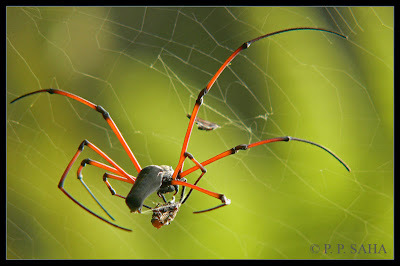 So here the collection of those Best Spider Photographs of India. 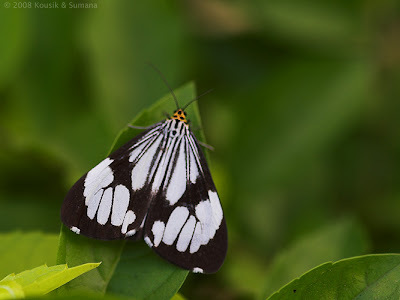 The first one was found at Bindu/North Bengal. It is Signature Spider or Speckled Band Fourlegs. This was found at Ailawng/Mizoram. I tried hard to shoot this because it was very restless. 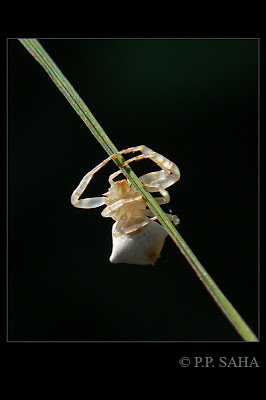 It is Crab Spider. But the name of sp. is not known to me. The last one was shot at Suntaleykhola/North Bengal. I was lucky that when I shot this one, it grabbed a prey. I observed many Giant Wood Spider in that forest but this sp. was not found too many. 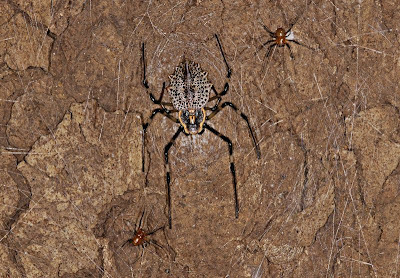 It is Black wood Spider (Nephilia kuhlii). Clicked in Yeoor (SGNP, Mumbai). 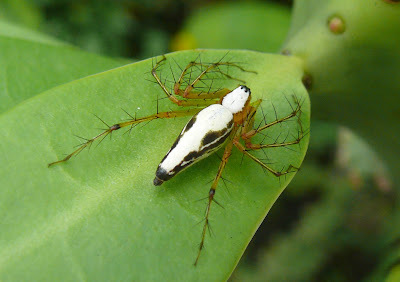 -White Lynx Spider, Oxyopes shweta, during the monsoon months in Sanjay Gandhi National Park, Mumbai. A very attractive spider! -A Spitting Spider, Scytodes pallida, pouncing on a Harvestman, genus Opiliones, which is not a true spider despite its eight legs. 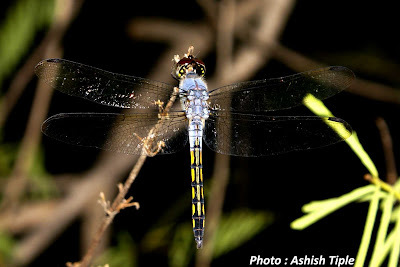 This was photographed in Sanjay Gandhi National Park, Mumbai during the monsoon period. 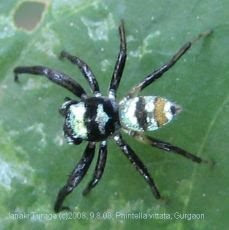 This beautiful spider was found in an overgrown vacant plot in a residential colony in Gurgaon. It was this iridiscent jewel which wanted to be left alone, but at the same time was also very curious. In order to know the new intervention-the camera, which it possibly perceived to be a threat, it climbed up the branch and to the highest leaf and showed its fangs and waved its pedipalps to scare away the perceived threat. And when that did not work, it jumped on my hand and walked over it and jumped right back to its leaf. The Lady Bird Larva was neither the prey nor predator. 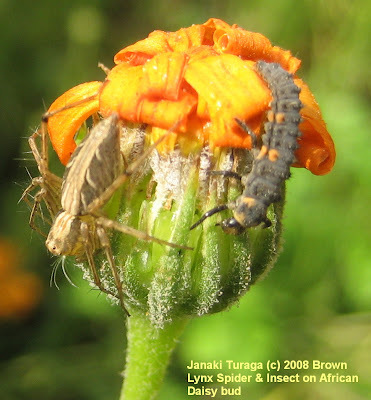 It roamed all over and the Brown Lynx spider made way for it! It was pretty much amazing. Well here are both of them sharing space on a African Daisy flowerbud! 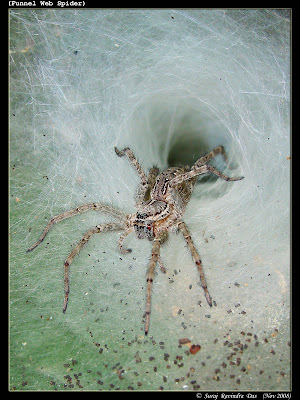 This is my 3rd and final best photo for Spider photo of the year 2008. 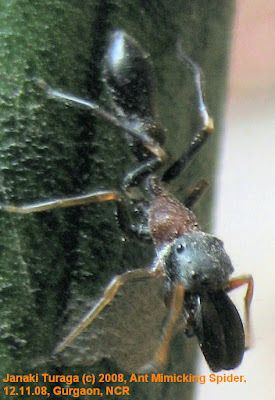 This is an Ant Mimicking Spider found at a home and it was difficult to spot this amongst other ants. But this was very common too. It was found walking on the walls and amongst the potted plants, and inside home! This is one of my best Spider photos of 2008. I had always wanted to get a clean shot of the Funnel Web Spider, but it always slipped in before me. Finally, at Chinchoti waterfalls last November, waited patiently for this fellow to come out and got a shot of it. Can sumbody pls identify the species for me . 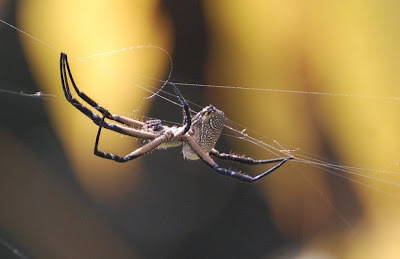 . .
Scorpion Spider : This one is from Periyar, Kerala. It looks like a flower petal and arranges itself in either vertical or horizontal hanging position. From this angle it looks as if it's enjoying his days resting in a Hammock ! Lichen Spider: This one is from Periyar,It was on a rock near a flowing stream.Saw this while sampling for fishes in second order streams and thought that it's some lichen. This one looks as some organism living in colder regions and hence developed fur ! 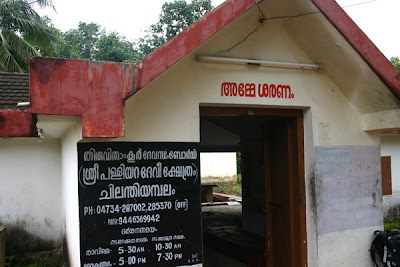 Darkness had now come upon the Thattekad forest in Kerala and we retraced our steps quickly. 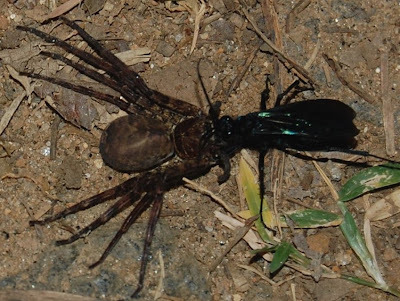 We had walked some distance when we noticed an on-ground drama taking place – a solitary long legged spider wasp, iridescent blue/black in colour was buzzing and circling around a large spider. 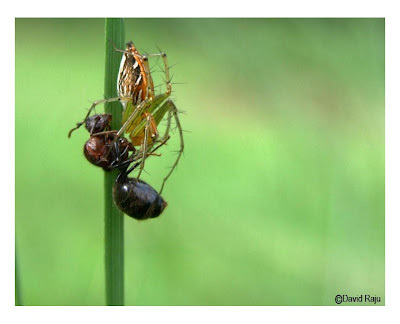 Seconds later the wasp dragged along the spider after having paralysed it! 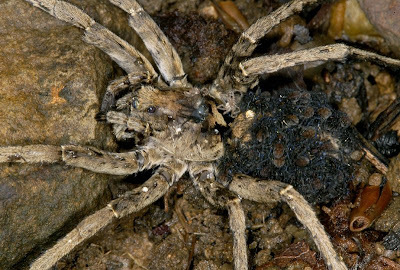 The spider may become a reproductive host for its offspring soon. 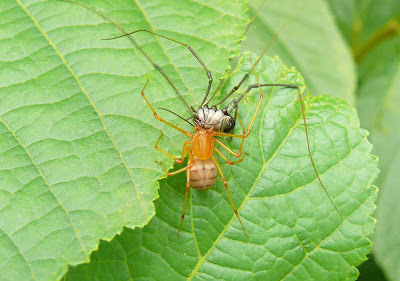 PS: I have read that there is a kind of tarantula wasp which feeds on tarantula spiders. 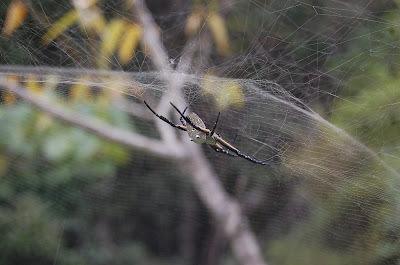 During our Narimale trek, after about 2.5 kms walk up the Bramhagiri hill range we found this beautiful spider in its designer cobweb. (A wood sign board near by mentioned MSL as 1195 meters) . 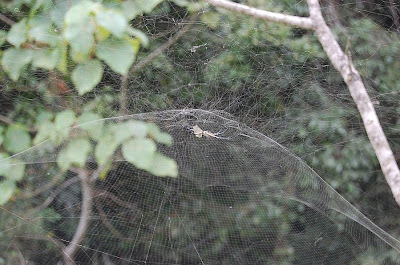 The bright sun rays on the silk threads and the ellaborate dense web made it a very attractive sight. We saw the same handsome spider again while climbing down in the same place and safe. 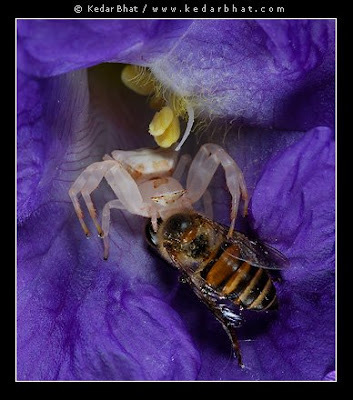 A white crab spider feeds on a honey bee inside a Karvy flower in Yeoor region of Sanjay Gandhi National park, India.